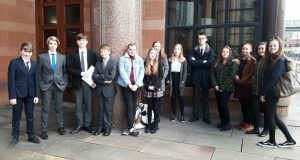 The local Magistrates’ Court Mock Trial competition took place in March at Newcastle Law Courts. The competition involved receiving a case study where we had to build a team of Lawyers (defence and prosecution), Witnesses, Magistrates, Legal Advisers and Ushers. We had to build a case and come up with arguments for and against for both the examination in chief and the cross examination based on the case we were given – in this case a knife crime. We competed with other North Tyneside schools and received excellent feedback on our performances.